Over three months in 2016, the Soberanes fire burned 132,127 acres of central California’s coast, blazing through dry swaths of dense chaparral, mixed hardwood timber and redwoods. Costing $260 million to suppress, it became the most expensive fire in the country’s history. And it wasn’t caused by lightning, which is relatively scarce in that part of the country, but by an illegal campfire in Garrapata State Park. Human-caused climate change has meant more, and bigger, wildfires throughout the country. But as astute pyrologist Bruce Springsteen once wrote, “You can’t start a fire without a spark.” According to new wildfire research, the source of that spark is, more often than not, a person. What’s more, due to these human-caused ignitions, the country’s conflagrations have grown significantly larger and more frequent, while the overall fire season has tripled in length. Firefighters work to contain the Soberanes Fire in California, which was started by an illegal campfire. Jennifer Balch, assistant professor of geography at the University of Colorado-Boulder, quantified just how significant humans’ role in providing that spark is. Balch and her colleagues investigated federal, state and local records provided by the Forest Service of wildfires on public and private lands from 1992 to 2012. They determined that 84 percent of the 1.5 million wildfires that burned nationally over those two decades were lit by humans, not including controlled burns intentionally lit for fire management. In total, humans started more than 1.2 million fires. Even in parts of the country where lightning strikes cause the most fires — such as the Intermountain West — humans have increased the number, size and length of the season for wildfires overall. By mapping the Forest Service data, Balch’s team found that fires primarily ignite in areas of human-wildland interface: roads, urban encroachment into wild spaces and the edges of agricultural fields. 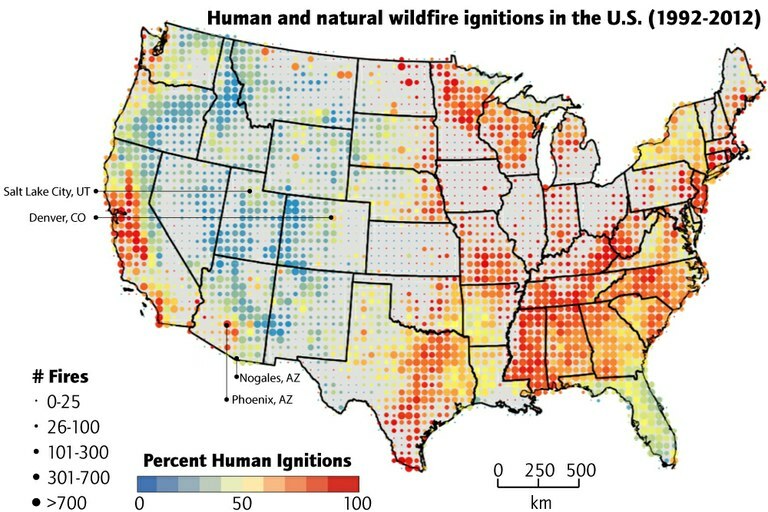 Areas of high human population density and fewer lightning-caused fires experience more wildfires overall. These include central and southern California, where lightning is dry but rare, and the East Coast, where lightning is common but often accompanied by fuel-soaking storms. And in urbanizing areas of the Intermountain West, human-ignited wildfires are increasing. This pattern can be seen along Colorado’s Front Range, where human-caused wildfires cluster where people have moved into wildlands near cities such as Fort Collins, Boulder, Denver and Colorado Springs. Wildfires are larger and more common in areas of greater human density. This pattern is clear in coastal regions. New research shows that it’s true in urbanizing regions of the West as well. Fire, as Balch pointed out, is a normal part of life. “From making breakfast on a gas-powered stove in the morning, to turning over the car’s combustion engine ignition, people use fire every day,” Balch said. 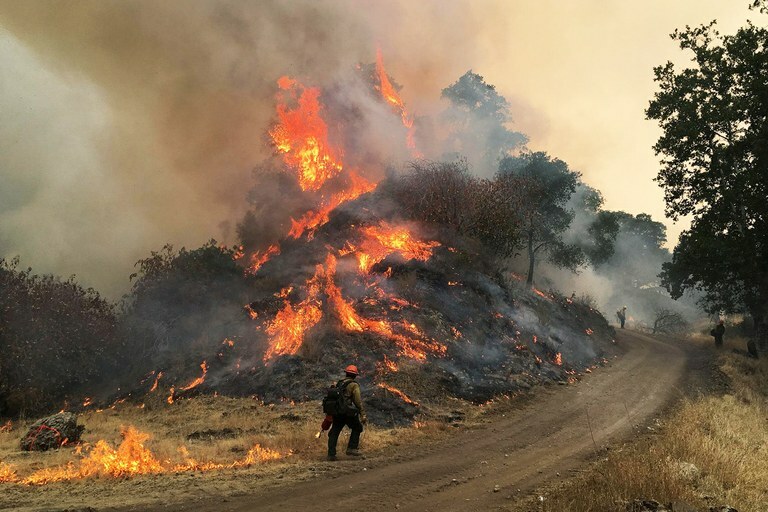 The causes of wildfires often are part of daily life, too: a cigarette flung from a car window; a power line arcing when everyone runs the air conditioner at once; a spark hitting dried vegetation when a motorist on the side of the road starts her engine. And while lightning-caused fires typically occur during the summer, human-caused fires are spread out throughout the year. Nationally, the fire season has grown by three months on average. In the past, people have been resistant to controlled burns near communities. People don’t like living near the “patchwork patterns” of a burned landscape, Balch said. And yet humans invite fire into their lives, sometimes just for the fun of it: The most common day for wildfire ignitions in the United States was July 4, with 7,762 fires burning more than 350,000 acres in 21 years. “Things might have been different if Independence Day was in winter,” Balch said. Note: This story has been updated to correct the number of fires started by humans between 1992 and 2012.